Bob Mehen checks out two tiny air pumps from a company that's new to the fishkeeping scene. Air pumps were once the bedrock of most aquarium filtration systems, powering the formerly ubiquitous undergravel filters, but the rise of power filters has left them largely used for aeration or decorative purposes. As a result, innovation has been slow, and many on sale today differ little from those of 20 years ago. So, it’s interesting to see a company take a fresh look at them. COLLAR is a brand that’s unlikely to be familiar to UK fishkeepers. This Ukrainian company started life producing dog-related products but has recently moved into aquatics with its AquaLighter LEDs. 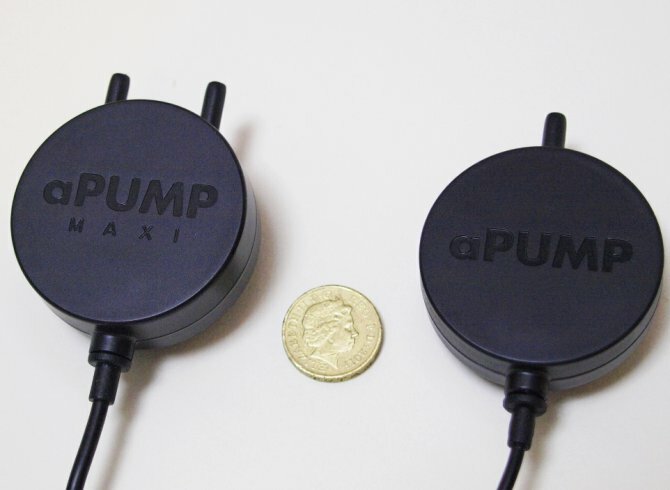 The aPUMP and aPUMP MAXI are another step in this direction, and COLLAR is keen to find a UK distributor for what it claims is 'the smallest and the most silent pump in the world'. These pumps are certainly tiny! The aPUMP is only 5cm/2in in diameter. The standard single outlet model is especially slim at 1.7cm/0.7in not including suction cup attachment, while the twin outlet MAXI is 2.3cm/0.9in. The perennial problem with air pumps, besides noise, has always been where to site them, but the aPUMP is designed to attach to the aquarium glass using a suction cup. As with all air pumps, I’d recommend fitting a non-return valve to prevent water syphoning back up the airline and into the pump when switched off. While not entirely silent, they are much quieter than others I’ve used. The manufacturer measures their noise levels at 35 and 40dB — what most would consider appropriate for a library. They’re rated for aquariums up to 100 and 200 l/22 and 44 gal respectively, with outputs of 35 lph and 70 lph, and they are claimed to work at depths of up to 80cm/32in. I tested them in my 60cm/24in deep tank and, impressively for such a tiny unit, there was no noticeable drop off in bubble production. The frugal power use of 1.5W and 3W should mean no sleepless nights over running costs. While the aPUMP is unlikely to power all but the smallest foam filters, as an aeration device for smaller tanks, its tiny size, discreet noise levels and frugal electrical consumption make it the perfect fit. It could also be used for adding aeration in small planted tanks where oxygen levels may drop when the plants respire after lights out. The burgeoning nano market should lap up the tiny, discreet aPUMP as a handy aeration device that shouldn’t keep you awake at night.